Morning reach Dwarka and Pick up from Bus Station/ Rail Station. Later transfer to hotel and check inn at hotel (Check Inn Time- 02:00 Pm/ Early Check inn Subject to availability). After fresh up change proceed for Bet Dwarka. Evening return back to Dwarka and you will be at your leisure in Dwarka or visit ShreeDwarkadhish Temple. Overnight at the hotel. Morning after breakfast depart for Somnath by surface approx 250 Kms/ 5 Hrs. Enroute visit Porbandar. On arrival transfer to hotel and check inn at hotel. 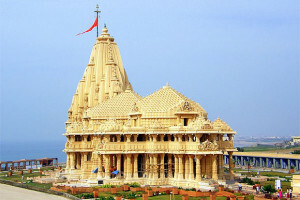 Later visit the temple of somnath one of the twelve jyotirlingas. The temple is famous in history for the various invasions on the temple for its wealth. Evening participate in shri Somanth Ji Aarti. Overnight at the hotel. Morning you will do Ritual Pooja and Abhishek in Somanth Temple. Afternoon leave for Diu approx 90 Kms/ 1.5 Hrs. Afternoon reach Diu and check inn at hotel. Evening relax or you will be leisure at your own. Overnight at the hotel. Morning after breakfast complete day day sightseeing of Diu and you can enjoy the beaches, churches and Portuguese Fort of Diu, Evening at leisure. Overnight at the hotel. After breakfast leave for Sasangir surface approx approx 65 Kms/ 1.5 Hrs. Afternoon reach and check inn at hotel. Afternoon you can take Jungle Safari (Subject to availability). Evening at leisure. Overnight at the hotel. Early morning proceed to Sasangir which is famous for its Asiatic Lion. Early morning go for game viewing in the Gir National Park (Subject to availability). After breakfast you will depart for Rajkot via Junagarh by surface approx. 190 kms / 4 hrs. Enroute we visit the Junagarh Fort. On arrival Rajkot transfer to Bus Station or Rail Station and for onward destination. Overnight in Bus/ Train.